Hands aching from all that corner-to-corner reaching? Enable one-handed mode to reduce the display size for easy corner-to-corner access. 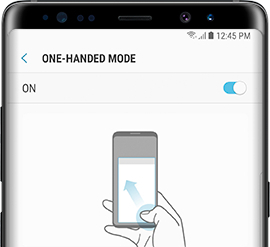 Activate one-handed operation mode for your convenience when using the device with one hand. 3 Touch the Search icon, and then search for and select One-handed mode. 4 To turn on One-handed mode, touch the slider. 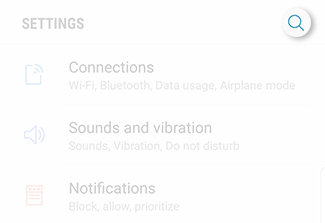 • Gesture: Swipe up diagonally from the left or right corner to reduce the display size. • Button: Touch the Home Key 3 times in quick succession to reduce the display size.